If you are interested in Kirkpatrick's life story, you may be interested in this You Tube video. Enjoy. 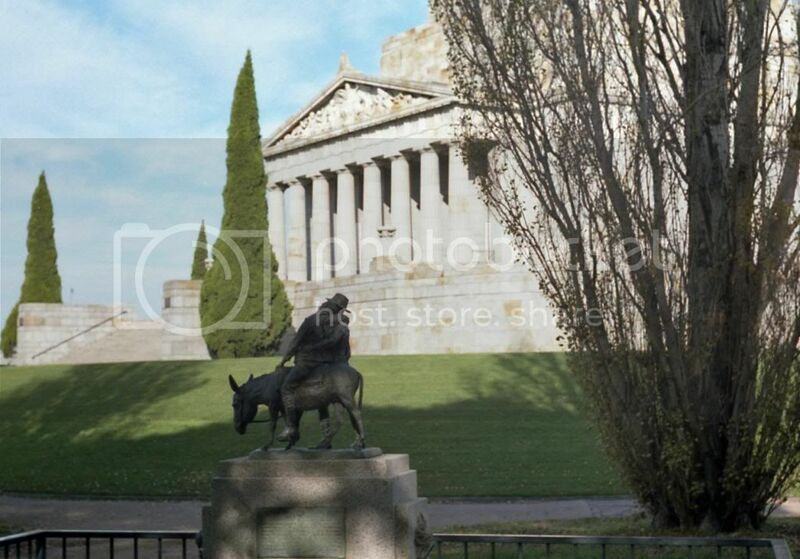 Three representations of the man with the donkey. The two "chainsaw" sculptures are on the Promenade at Lakes Entrance on the south coast of Victoria and the other one is the "official" one at the National Shrine of Remembrance in Melbourne. Perhaps they couldn't find an American actor who could do a decent Tyneside accent! Imagine if our own Ridley Scott happened upon the idea - now he could do the story justice. Over here, he is generally just known as Simpson and his donkey. Part of the ANZAC story. It would be a real tear jerker. He gets killed at the end trying to save the donkey from the turks who want to turn the donkey into kebabs. Here's a different view of the statue taken on a visit by my brother in the mid 1980s. I am researching my family tree. Reading your article, my grandfather was called John James Shaw and lived 38 Eleanor St/ Dale St, the same period. I, and my sister were born and lived at 6, Eleanor St 1951/54. Any info would be great.